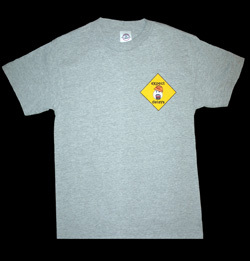 This is our political t-shirt in honor of the "Grand-Daddy" of all modern delays - any progress towards any goal in Iraq. This shirt will have different meanings for different people, depending on one's perspective and on how the "operation" has effected one's life or loved ones. One thing we all can agree on though, is that we must support our troops who are giving their all for us, regardless of how we feel about the Iraq operation itself. 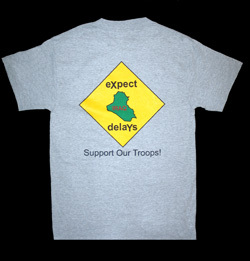 The Delays in Iraq T-Shirt is screen printed on a Delta Pro Weight short sleeved gray t- shirt, which is 90% cotton and 10% polyester with the eXpect delaYs logo, featuring "Gus", on the front over the left upper chest and the large graphic on the back.